Vintage Voices – Blog Tour – Sinagiri. Set 2000 years ago in the mysterious Kingdom of Rajah Kasyapu, in the centre of the tropical island of Ceylon. This thrilling historical novel relates the trials and tribulations of the Ethiopian princess Abebech and her marriage to the Raja. 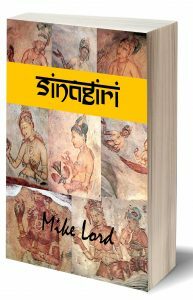 Mike Lord has based his novel on a chance encounter with a portrait of the imagined princess in an ancient fresco on the walls of the old palace at Singiriya, which lay hidden from western eyes for a thousand years. Today you too can visit the Hall of Mirrors, and see the remaining frescoes, if you can climb the stairs to the ruins of the castle. Mike Lord has worked for over 50 years in what is called “developing economies”. Most of the time Mike’s work has been with the thousands of small scale farmers, who have appreciated sustainable livelihoods, so that they now have enough food to feed themselves, and also some to sell so that they have a cash income. That is why most of Mike’s novels are set in these countries and especially the remote locations. Three years ago Mike finally retired and started writing, and has now produced 32 fantasy romance books nine of which have been published, and 23 self-published at Smashwords and Amazon KDP. Mike Lord is a member of the Romance Writers of Australia. The others looked at one another, but one man spoke up clearly. They looked at one another and nodded. This was not the first time that Abebech had begun to think that the Raja might be having problems. She also wondered why her father’s emissary was not there to greet her. No more was said. The people who had been showing them around had been kind and considerate, and had been helping by translating words they heard, and in explaining everything that they had seen that day. Anarajapura was truly a magnificent city. Apart from the magnificence of the buildings, the streets were wide and straight, there were almshouses, rest houses for travellers, arches decorated with flags, clean sand strewn in the streets, a vast array of shops and flower stalls, and from time to time they had seen a profusion of animals, jugglers, dancers, musicians and peoples of all nations. A separate mansion, indeed a palace, had been prepared for their stay in Anarajapura. It was built from stone and carefully finished in white lime. There were two stories, and Mekoria found a subterranean section two floors below his bedroom. There were guards, and gardeners, and a profusion of flowers and fruit trees in the gardens. The house had carpets from Persia and Irak, silk furnishings from China, chairs and stools covered in leather and local fabrics, with white cotton overlays in every conceivable place, and a whole host of smartly dressed servants at every level in the house. Visitors came to greet them until late in the evening, and a whole pile of gifts was accumulating in the main hall. Some of the visitors said that they would be coming with them to Sinagiri in the morning.